The Power Line Show, Episode 34: Back in the Arena! The Power Line Show was on hiatus while I toured Australia and the Caribbean. But I’m back now, and yesterday Scott, Steve and I recorded Episode 34 of the Power Line Show. Our guest was Pete Hegseth, an old friend from his days in the military and with Vets For Freedom. 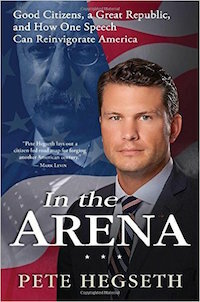 Pete’s new book is called In the Arena. He talked about his experiences as a soldier in Guantanamo Bay, Iraq and Afghanistan. Pete assesses Iraq as a tough war that was won, due to the surge, but then thrown away by the Obama administration. Afghanistan, he sees as a hopeless country and in that sense the wrong war. The conversation moved on to citizenship in a republic and the future of conservatism, two principal subjects of Pete’s book. The remainder of the show was devoted to the current political scene. With Trump a near-inevitability, reactions ran from pessimistic to deeply pessimistic to let’s get out the popcorn. As Steve says, there’s got to be a morning after. And Scott says, yes, the morning after is when Hillary gets inaugurated. It is a fun, lively show. Don’t miss it! Simply tap above to play; this works if you are reading on an iPad or mobile device, too. Or click here to listen or to download the episode directly to your computer or mobile device. The Power Line show is also available on iTunes. If you go here, you can subscribe on iTunes and never have to miss an episode. Be sure to rate us five stars, too. Power Line is supported by Power Line VIP. Please consider subscribing to VIP today–it eliminates most ads and supports the work we do here. Click below for more information.